This week, Stephen Ibaraki, FCIPS, I.S.P., ITCP/IP3P, MVP, DF/NPA, CNP, FGITCA has an exclusive interview with Yasas V. Abeywickrama. Yasas V. Abeywickrama was recognised in 2003 by CIMA (UK) as an up and coming business leader for the future. In 2009 he was named the Young Professional of the Year by Professions Australia. In 2011, Yasas was recognised with a TOYP award (Ten Outstanding Young Persons). Yasas has enjoyed a distinguished career thus far, working in the UK, USA, Sri Lanka and Australia in project management, business analysis, consulting and training, and later emerged as an entrepreneur. He has also been trained in the USA, Sri Lanka and Malaysia. He started his career at Virtusa in 2003, a US-based global provider of software development and ICT services in Sri Lanka. Yasas began in Software Engineering and later moved into Business Analysis roles, which saw him travelling around the world with postings in the USA and UK. During this period, Yasas had the opportunity to work on projects for high profile companies like British Telecom & Siemens. Later Yasas worked for Accenture, the world's biggest ICT consulting company. At Accenture he had the opportunity of serving major clients such as Telstra (the leading telecommunications provider in Australia), and his area of responsibility was around consulting and project management. In 2010, Yasas returned to Sri Lanka permanently to serve his motherland. After his return, he co-founded Lanka BPO Academy, which is Sri Lanka's largest and pioneering organisation for training people for the Business Process Outsourcing (BPO) industry. He is a proud product of Ananda College Colombo. He was an ardent debater during his school days and was the Vice President and Secretary of the Sinhalese Oratory and Debating Society. After leaving school, he served his alma mater as the Secretary and subsequently as the President of the Millennia Group of Ananda College, an OBA group of the college. He was the Vice President of Ananda 99 Group and a committee member for a number of years. He is a graduate of the University of Colombo, where he obtained an honours degree in Computer Science (2004). Yasas holds a Masters in Entrepreneurship and Innovation from Swinburne University of Technology in Australia (2010). He held the highly influential role within the ICT sector as the Director of Young IT Professionals Board of the Australian Computer Society (ACS) in 2009 and 2010. In this role he had the crucial role of devising strategy to promote ICT among young people as well as to serve the needs of the younger segment of the industry. He also played a consulting role for South East Asian Regional Computer Confederation (SEARCC) in 2011. 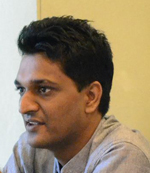 Since 2012 he has been an active member of the Computer Society of Sri Lanka, which is the apex body for IT professionals in Sri Lanka. Yasas has served the Executive Council for many years and is currently the Secretary. As a freelance journalist, he has written widely. He writes a regular column for The Island for nearly four years now. He was a guest resource person for FM Derana and TV Derana. Yasas wrote a regular column for two years for the PC Authority magazine in Australia. Currently he is a presenter for the Rise & Shine Morning Show on Channel Eye. He has published a book on Business Information Technology (BIT) entitled 'A bit of BIT' (ISBN: 955-99562-0-5) and written articles for various publications. This was the first book by a Sri Lankan on Business Information Technology and it was published when he was just 26 years of age. The key objective of Yasas’ writing has been to educate the wider community. His second book will be out in mid 2014. Yasas is also a fluent public speaker in both English and Sinhalese. He started his speaking career at a young age while at Ananda College as a debater, and today speaks to students at distinguished gatherings such as conferences, seminars, school events, professional events and other social gatherings. His topics include ICT, BPO, ICT/BPO Awareness, Career Options, Career Guidance, Economic Development, Business, Entrepreneurship, Leadership, Youth Motivation and many more. Yasas has travelled quite a journey leading by example and has become an exemplary role model for young people in any field. Today he is one of the most visible faces of young professionals and entrepreneurs. :00:30: Overview your top three major successes and some useful lessons learned from each. "....I'm still fairly young; I've had a career of about ten years. I started my career as a software engineer initially and moved into business analysis, into consulting in IT, into project management and later started as an entrepreneur. It's a long story in that way, a software engineer becoming an entrepreneur and along the way I was writing books, writing a couple of columns and became a lecturer and a trainer....My first lesson is if you really want to do something, you've done the planning, preparation and have a plan to go ahead, you actually could do well. That lesson has helped me throughout because I believe in myself to do almost anything....The second is the understanding I developed about people....The third is if you have a good business idea and a plan, there's an opportunity to implement that successfully as long as you work hard and also keep close to your plans...."
:07:36: Can you tell us more about your current major roles? "....My main role and major responsibility is the business that we started four years ago, Lanka BPO Academy — I'm the CEO and one of the co-founders. My major responsibility is to develop business from where it is today to a different height over the next couple of years....The Computer Society of Sri Lanka (CSSL) represents Sri Lanka in IFIP. I've been on the CSSL Executive Council for quite a few years now and currently I am the Secretary, so that is a fairly significant responsibility to make sure the Board runs properly....About a month ago I was appointed as the Chairman of InterYIT of IFIP (International Young ICT group), which represents the young ICT professionals who are (roughly speaking) under 35 years across the world. My responsibilities are to ensure that IT professionals as well as their groups around the world get the right support and also have the strategic direction....Lanka BPO Academy, Computer Society of Sri Lanka and InterYIT of IFIP are the three major things that I do...."
:12:38: You talked about this academy that you started several years ago, Lanka BPO Academy. Are you small or medium in revenue? "....I would say in terms of Sri Lankan standards we are medium sized. We started as a very small company, all together about six people at the very beginning. We now work with about fifteen full timers and about 20 to 25 part timers....Basically Sri Lanka is one of the newer hubs for the BPO industry in the world. India is number one and the Philippines is also one of the major players. Likewise Sri Lanka is in the top 16 or 20 and Lanka BPO Academy is the only dedicated training provider in this industry in Sri Lanka...."
:15:38: Some of the audience may not be aware of some of the details about Sri Lanka. What is the population of Sri Lanka and so on? "....Sri Lanka is a fairly small country and in terms of land area we have 65,000 square kilometers and we have 21 million people living on this island. We are located a little below India and it is known as the pearl of the Indian Ocean. Our closest neighbor is India. It has tropical weather so we have lots of rain and lots of sunshine. It's a beautiful part of the world. In the recent past tourism has picked up a lot and Sri Lanka was identified as the most attractive tourist destination in a couple of the world rankings...."
:19:49: Yasas talks more about his role with the Computer Society of Sri Lanka (CSSL) and IFIP IP3. "....We are now starting to become a little more active and more engaged and my role as InterYIT Chairman I think would help in that...We've had a couple of conversations with IFIP IP3, studied and also learned lots about the professional aspects IP3 has to offer....Maybe in the time to come we'll see more active ways of engaging with IP3. At the moment we haven't really nailed down the way that we could work with IP3 and that is something for us to do in the near future...."
:25:22: What do you plan to do next? "....As an entrepreneur it is very difficult to think something outside of what you are doing at the moment to be honest, because once you are committed to something, really believe in it and have the passion for it, you really want to do well. As an entrepreneur that's where I am today. I know after five years or so I might have a different opinion on my vision, but for the moment I'm thinking of doing a better service to the society through our organization, but outside BPO Academy, through CSSL I would like to do a bigger service in terms of developing professionalism and also developing networking opportunities...."
:29:00: What are the next books in your future? "....It's very timely that I speak to you. I just published my second book. It's called 'The Catalyst'....It covers about ten areas, including entrepreneurship, IT, BPO is another topic which comes inside that, careers, education, soft skills and these sort of things are covered in The Catalyst book so it's kind of a multi-purpose book...."
:31:37: You indicated your book is going to be available in Sri Lanka, is it also going to be available online, (for example through Amazon), so that the global audience can have access to it? "....I will definitely look at international mediums because today with the advancements of technology you are talking to an international audience as well. For example, if I publish something on my Facebook group I have about 1000 friends, and out of those 1000 people probably 3 or 400 are Sri Lankan but the majority are from overseas because I work around the world, so immediately I am accessing a global market although small, but it is still targeted. In that kind of technological environment it is important to make sure that you keep those channels open..."
:35:37: What are your top five business best practices? "....One of the important things that I always practice is keeping communication lines open with multiple stakeholders....One of the areas that we teach, and at the same time as an organization try to implement, are best practices around customer service....Best practices that we do around direct marketing....Apart from these major three that I would list are things around accounting practices, internal control, timetabling and quality practices in making sure the students are training their best...."
:39:03: You are an entrepreneur and you have been able to build this small private company into a mid-sized company. What would be your top entrepreneurship best practices? "....Trying it yourself, doing it yourself is one of the things that I practice....Being creative is being flexible, because if you have a rigid mind and no flexibility it is difficult to succeed in entrepreneurship....Keeping an open mind and making sure you know what's happening around you is also very important....Keeping an eye on and having an understanding about the accounting and numbers...."
:46:35: You are now the Chair of this young professionals program (InterYIT of IFIP), what are your top tips for motivating young people? "....Qualifications and education add value, but what really makes a difference is a visual game plan, (what you want to achieve, your objectives, goals and very important, the way you outline how to get there, a plan)....The second thing is working hard. If you don't work hard it is very difficult to achieve your end objectives....The third area is believing in yourself. Most young people don't believe in themselves. They sometimes read stories about various entrepreneurs and other successful people in the world but at the same time doubt whether they could do that or whether they could be that. Unless you believe in yourself others are not going to believe in you....Another thing I tell young people is about the important decisions in their life. Most critical important decisions in one's life are typically made in the younger age, eighteen to say twenty-five...."
:55:32: What would you consider to be your one top failure or challenge and the lesson learned from it? "....Of course I've had quite a few failures, but I would consider them as lessons rather than as failures, because failures are pillars of success as well. One 'lesson' for me was when we started this young company Lanka BPO Academy, I sometimes feel we didn't have the full depth understanding about the student market in Sri Lanka. I'm not regretting what we did, but I feel if we studied a bit more at the beginning we would have done certain things differently — picking certain market segments, certain market product lines could have been done a little better. That's the lesson learned on my career as an entrepreneur...."
:59:00: Yasas talks about what he considers to be the number one area of controversy in the areas that he works or has worked. "....If you don't have those open lines of communication, you cannot be clear of the expectations of different people....This lesson that I learned quite a few years ago is still helping me in terms of controversy...."
"....I believe recognizing IT as a separate profession is important and recognizing those qualifications across the globe is important so that we can use these people across the world in different countries and different companies....I feel we are still in the early stages of developing a global profession, but it has to start somewhere and I believe that IP3 and IFIP could play a major role in terms of recognizing different qualifications of professionals in different countries, and in general, IT professionals for their different skills. I think as an industry we have to get there...."
:01:06:47: From your extensive speaking, travels, and work, please share some stories (amusing, surprising, unexpected, amazing). "....I was just a university student, no brand name, not much experience, no connections, no contacts, no networks, but it didn't really bother me and I didn't stop and I continued to send articles to the editors and one of the national newspapers started to pick my articles....It was amusing to me and to some of my friends to see my name on paper but it was also unexpected and surprising. It also shows that if you really want to do something there's a way to do it and if you keep on trying there will be opportunities and doors will open...."
:01:15:10: If you were conducting this interview, what 2 questions would you ask, and then what would be your answers? "....How do you manage your professional role with your personal life?....How are you utilizing social media for your business and professional activities especially in terms of maintaining the profile?...." :01:20:14: Yasas, with your demanding schedule, we are indeed fortunate to have you come in to do this interview. Thank you for sharing your deep experiences with our audience.